Monkey around this Halloween in a chimpanzee suit! The plush monkey suit has a detailed, flesh-colored chest piece. The suit is covered in black synthetic hair and has three ties in the back to secure the costume. Synthetic hair covers the full chimp mask. The mask features a friendly chimp face with slits for the eyes, nostrils and mouth to provide clear seeing and breathing. An interior elastic strap keeps the mask in place. Chimp gloves and shoe covers are also included. The gloves have hairy wrists with latex hands while the shoe covers feature a black cuff that velcros around the ankle and latex feet which are held in place with elastic straps. 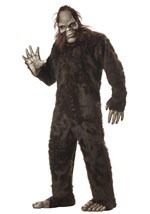 It will be impossible to keep a straight face when everyone sees you in this funny chimpanzee costume!